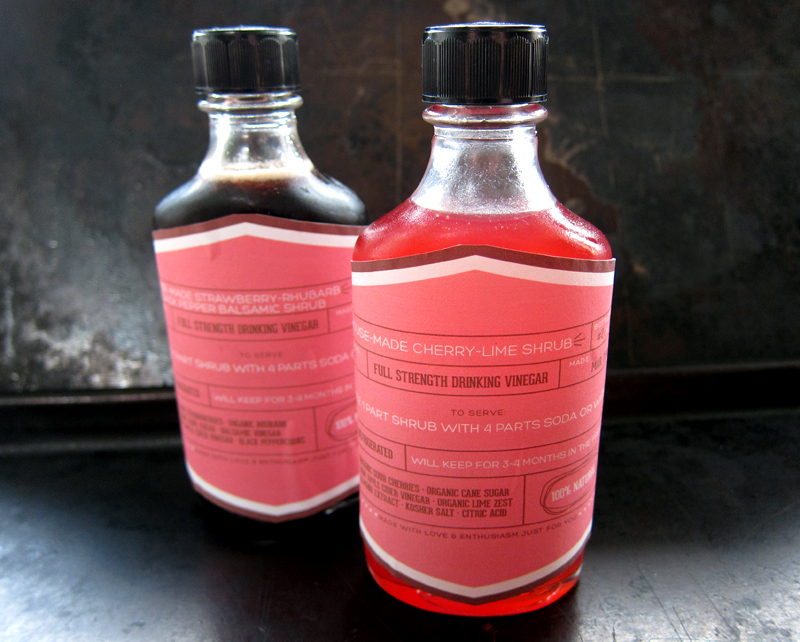 When I first heard about drinking vinegars, I was instantly shrub-curious. For someone who grew up sneaking pickle juice out of the fridge, a tart, vinegary beverage sounded quite delightful. 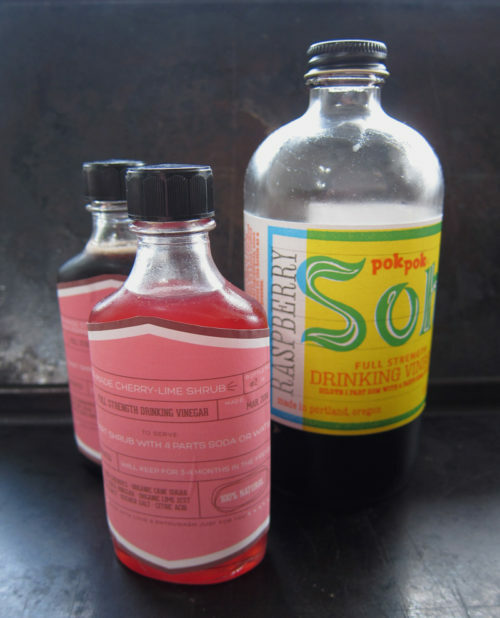 Portland’s Pok Pok restaurant was where I first became a shrub initiate and back in October I bought myself a bottle of their raspberry Som – a bright and fruity drinking vinegar. I had it mixed with soda water in their restaurant, but when I drank it at home, I mixed it with plain old tap water (and an ice cube or two) and found it very refreshing and pleasantly bracing. I was smitten with the shrub. So when my bottle of Som was almost empty, I decided to take matters into my own hands and come up with a couple fruity variations. 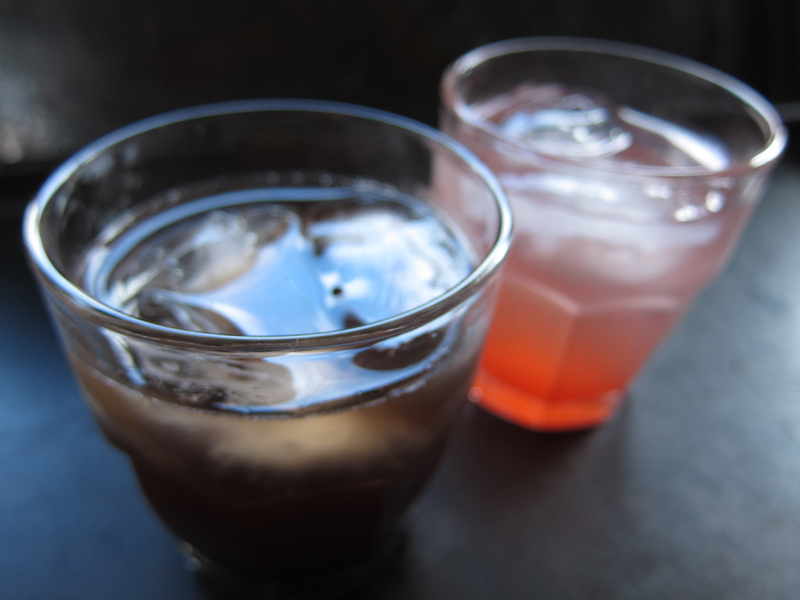 When making a drinking vinegar, you can choose 2 methods. The first one, is a cooked version where you melt the sugar along with the fruit over heat and then add in the vinegar. I wasn’t sold on that process, so I choose the other method – the no-cook one, letting the sugar and the fruit macerate at room temperature with only a bit of agitation (be it shaking and stirring) to help melt the sugar into syrup. If a little bit of fermentation happens too, all the more in terms of flavour. 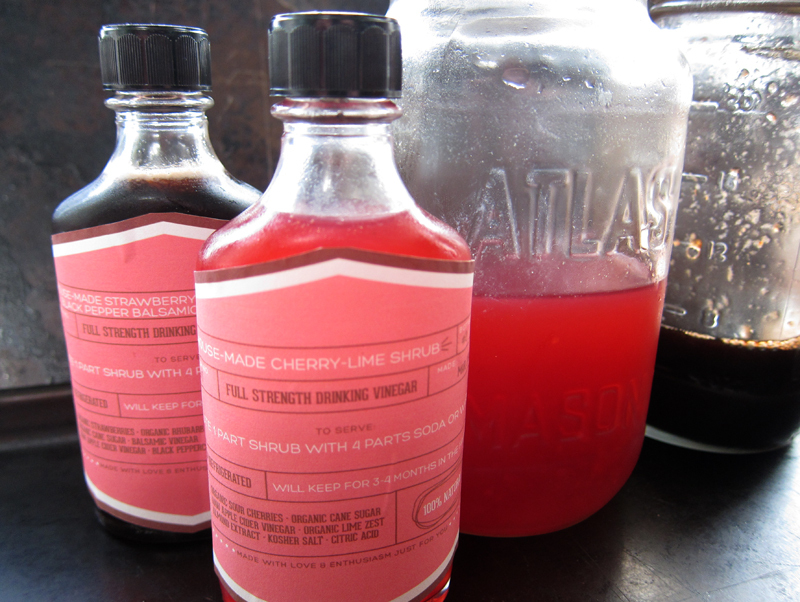 I used raw apple cider vinegar for the cherry-lime version & ACV + balsamic for the strawberry but you can definitely play with your vinegars here. Ideally, this is a wonderful way to preserve your summer fruit bounty. But for me, it was a way of making more room in my freezer by clearing out some of my precious fruit stash. 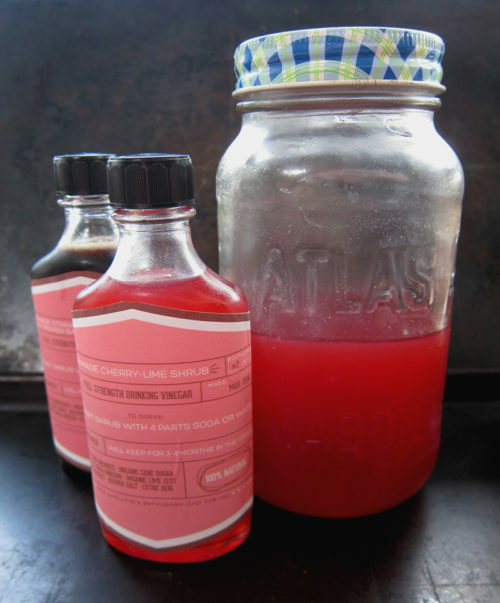 If it’s summer and you have some bruised or fruit that’s about to turn, make a shrub! But it’s just as easy to do with frozen fruit too. I decided to make 2 varieties. The first one, a sour cherry lime shrub was inspired by my old macerated sour cherry conserve recipe that uses lime zest and almond extract to bump up the flavour of the sour cherry. And as a shrub, the results were incredible. Bright, lively and delicious. The second shrub helped to use up some frozen rhubarb and some strawberries that I had leftover from breakfast. Clearly, it’s not yet strawberry season, but I couldn’t resist a box of California berries when I spied them at the market. The imported strawberries were large so I cut them up into halves and quarters for the recipe. Black pepper and balsamic vinegar seemed like a natural pairing. The final product was delicious. The strawberry flavour was a big POW to the tastebuds while the other flavours took a backseat – present, but much calmer. It was a tasty drink. I got more syrup out of the cherry mix than the strawberry-rhubarb one. Maybe because rhubarb isn’t the most juicy fruit – so plan accordingly. I have yet to try these as a drink mixer in a cocktail, but I’m curious for your recommendations. 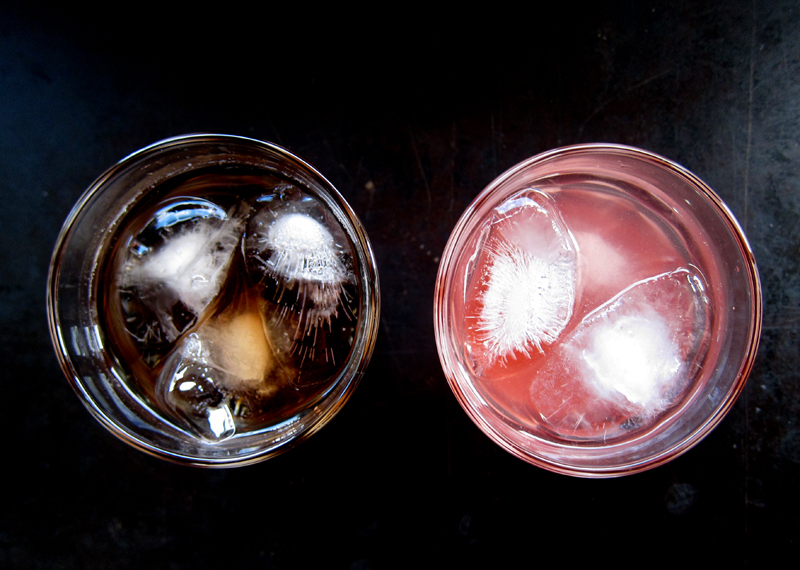 Vodka, tequila, gin or bourbon? I’m curious for a delicious boozy pairing. And yes, this makes a perfect gift. I made a label using sticker paper and a couple cute bottles I had thrifted to give to a friend. Sweet cherries can be substituted here for a different flavour. Citric acid and salt are optional – I just added them because the bottle of drinking vinegar I had purchased from Pok Pok included these ingredients, so I decided to go all in. Add the cherries, along with the sugar, lime zest and almond extract into a large 1-litre wide-mouth mason jar. Let sit at room temperature for a day or two or three (I did 3 days), giving the jar a shake and a stir occasionally to help melt the sugar. When the sugar has melted (no grains, ma! ), use a fine mesh strainer placed over a bowl to strain the syrup from the cherries. Use a rubber spatula or your favourite implement of choice to press out all the syrup. Reserve the spent cherries for another use (mixed into yogurt is a delicious suggestion). Whisk in the apple cider along with the salt and citric acid into the cherry syrup and return the shrub into a clean, large glass mason jar. Will keep in the fridge for a couple of months, but it probably won’t last that long. 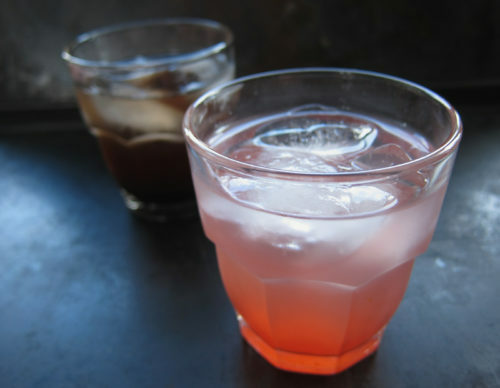 While the shrub is ready to drink immediately, its flavour will change over the course of a few days. Makes approximately a half jar of syrup. To serve, mix 1 part shrub with 3 to 4 parts water or soda. Enjoy! While I enjoyed the flavour of the balsamic vinegar here, I was disappointed in the colour. I wanted lively pink! Instead, I got dirgey darkness. So if you have access to white balsamic vinegar, go for it! Or try a bright coloured red wine or fruity vinegar instead. Add the strawberries, rhubarb, and sugar into a large wide-mouth mason jar. Lightly crush the peppercorns with a mortar & pestle and add them to the jar. Let sit at room temperature for a day or two or three (I did 3 days), giving the jar a shake and a stir occasionally to help melt the sugar. When the sugar has melted (no grains, ma! ), use a fine mesh strainer placed over a bowl to strain the syrup from the fruit. Use a rubber spatula or your favourite implement of choice to press out all the syrup. Reserve the fruit for another use or discard. Whisk in the vinegars and return the shrub into a clean, large glass mason jar. Will keep in the fridge for a couple of months, but it probably won’t last that long. 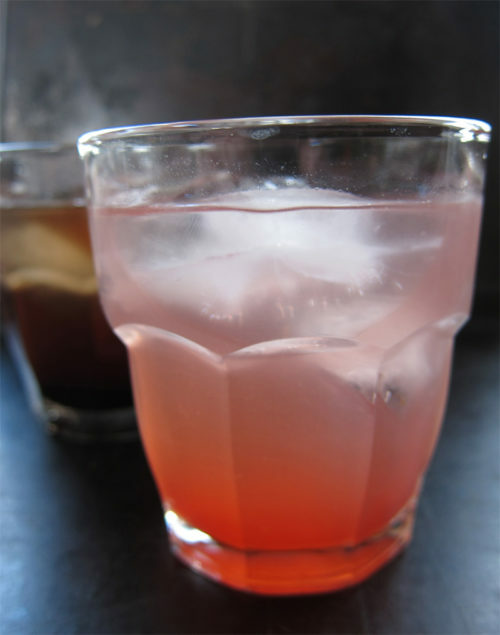 While the shrub is ready to drink immediately, its flavour will change over the course of a few days. Makes a bit less than a half jar of syrup. I’ve had shrubs in cocktails at a few restaurants recently and loved them all! There’s something about that fruity yet slightly sour flavor that is fabulous. Love that you figured out how to make them at home! I Have been very interested in the process of making vinegar drinks for a while now, looks like you really nailed it here. Beautiful pics! Joanne, it’s so simple to do. I hope you try out your own version. Thanks Cheri, I’m thrilled with the results. Sues, I’m sure of it! They’re wonderful and unique. I live in Portland and always marvel at the colorful row of drinking vinegars at Pok Pok, but end up ordering a Beer Lao to go with the spicy food. I love kitchen projects like this so I’ll definitely give it a try! Erica, definitely give them a try! They’re refreshing and have bite! Do you maserate the cherries in the jar before letting it sit or do you just put them in and let nature take its course? Aimee, you could use a masher to smush the cherries into the sugar, but I just let nature take its course. I’m super excited to try out this project. I’ve already expressed my enthusiasm to you elsewhere, but it doesn’t hurt to add a blog comment too! I have a bag of frozen griottes in my freezer that are just begging to be turned into shrub. Yum! Pretty colour. Interesting sounding drink. So curious to try it.